Hanoi is the capital of the Socialist Republic and is dominated by colonial buildings and tree-lined boulevards. The city boasts a convoluted yet elegant history which is characterised by its ‚chameleon of names‘ – the city has changed names many times throughout history. In terms of recent history, the French withdrew their forces in 1954 and ever since foreign investment and property has developed substantially. In Hanoi, exploring on your own is relatively easy on foot or by bike. Many travellers believe the true appeal and essence of Hanoi is discovered wandering the streets, tasting local market food, observing the local way of life, and taking in the architecture and surroundings. Interested in visiting Ha Long Bay? On Day 2 you can arrange to visit the incredible Halong Bay, famous for its limestone islands jutting imposingly from the sea into the Vietnamese skyline and can even spend the night on a traditional junk boat. As this trip is so popular we highly recommend booking in advance to avoid disappointment. Please speak to your Adventure Specialist for more details. We take a flight across the border to Vientiane. The capital of Laos is extremely quiet – so quiet that, before 1970, there was only one set of traffic lights in the entire city (a far cry from some other South East Asian cities!). We have time to admire this tranquil city with its many murals and markets. Many buildings you will see when you wander the streets are of religious significance. You may wish to hire a bicycle and explore the local streets and markets which are excellent here. Tonight your Tour Leader will take you to the 10-pin bowling range – a mecca for backpackers! Enjoy a beer and try for a strike or two! Laos‘ currency is the Lao Kip (LAK). As we make our way north from Vientiane we travel through stunning scenery to Vang Vieng. This peaceful town is situated in a plateau with stunning surroundings of limestone caves and waterfalls, and the area is inhabited by the Hmong and Yao tribes. The limestone caves are renowned in ancient mythology and have featured in the prose of many artists throughout time. Vang Vieng is an excellent place to try the local cuisine and there are markets to indulge in. Feeling energised we will take a bicycle tour off the beaten track through some of Laos‘ most incredible scenery and view a wonderful sunset across lush paddy fields before arriving for a swim at the Blue Lagoon. We travel from Vang Vieng on the scenic route 4 to the sleepy town of Luang Prabang. Many say this is the most memorable town in all of Laos. Renowned for a fascinating history, some of the friendliest people and beautiful landscapes, Luang Prabang is a true gem in South East Asia. We have two days to enjoy this peaceful town, which is located 300 metres above sea level on the upper Mekong. We have the opportunity to watch the local monks collect alms early in the morning, a truly humbling expeience. As you explore you will see that Luang Prabang is dominated by Phousi – the marvellous hill-top temple that sits in the middle of the town. You’ll notice a combination of Lao, French and Lao-French colonial influence as you admire the city’s buildings and architectural highlights – all of which you can see discovering the town on foot. There are many temples to visit in Luang Prabang – over 30 in fact, which is a large number for this small town. Along the way you may encounter some young monks eager to practice their English skills as well. Today we fly to Chiang Mai where you can enjoy two nights in this popular town – known as the ‚Rose of the North‘. Here you can enjoy a Thai cooking course, relaxing massage, take in a night-time Thai kick-boxing bout (Muay Thai) or haggle the night away at Chiang Mai’s famous evening street bizarre. The following day we journey into middle Thailand taking a train to Phitsanulok before continuing to the ancient city of Sukhothai. Thailand’s ancient capital Sukhothai is home to the ancient ruins of the former city. A popular highlight of Thailand, it was the capital of the Thai empire for approximately 140 years and translates literally to “Dawn of Happiness”. The temples and monuments have been since excavated and reconstructed in places, the restoration now naming the destination Sukhothai Historical Park. We will take a bicycle tour around the World Heritage Site and explore the typical Thai architecture including the Wat Mahathat, one of the most spectacular Buddhas seated amongst the stone ruins . Thailand’s capital, Bangkok, is a crazy and chaotic city! Known in Thai as Krung Thep Maha Nakhon pronounced or Krung Thep „city of angels“ for short, Bangkok was a small trading post at the mouth of the Chao Phraya River during the Ayutthaya Kingdom. Bangkok is now the gateway to South East Asia for most travellers and international backpackers come and go and the streets are always buzzing and full of life. No visit to Bangkok is complete without a visit to Khao San Road, the famous strip filled with markets, stalls, neon lights and young backpackers. From people watching to shopping, and nightlife to food and drink, this is the place to be on a night out in Bangkok. If you’re feeling adventurous you might wish to try a fried insect or two! On a more cultural note, Bangkok also boasts hundreds of Wats (temples), with Wat Arun being the main one visited by most travellers. The Grand Palace is also a popular attraction, and for something different you can cruise along the Chao Phraya River and through the canals. Bangkok once had an elaborate network of canals and was given the nickname, ‚Venice of the East‘, and although some of them have been filled in and converted to streets, many still exist today. Travelling through these canals you will see how the locals live along the riverside – you almost forget you are in a large, bustling city. Thailand’s currency is the Thai Baht (THB). The name Siem Reap means ‚Defeat of Siam‘ – today’s Thailand – and refers to a century-old bloodbath which you can see commemorated in stone in the celebrated bas relief carvings of the monuments around the area. Tonight your Tour Leader will take you to the famous Pub Street where you can enjoy a few drinks and meet your group properly! The following day you can head out on an optional excursion to the most famous temple, Angkor Wat, with a guide to give you an overview of the history and layout of the temple. There are over one thousand temples here which attract over one million visitors annually. The temples range from small ruins to the famous Angkor Wat, and the site is said to be the world’s largest single religious monument. Angkor Wat, a UNESCO World Heritage site, pays homage to the Hindu god Vishnu and has a dazzling array of beautiful ornate carvings. The many ceremonial structures and temples here were built between the 9th and 13th centuries by the Khmer Empire that spanned a period of approximately 600 years. These temples are some of the most famous in the world and take up an area of approximately 400 square kilometres. There are superb photographic opportunities here at most times of the day so make sure your camera batteries are fully charged and your memory card is ready to go! Tuk-tuks provide a convenient form of transport around the area here, and you can hire a tuk-tuk and driver for the day if you wish. The Angkor area (in and around the Ta Prohm temple) was the site where the film Tomb Raider starring Angelina Jolie was filmed. Phnom Penh is Cambodia’s bustling capital city with a turbulent past. Located on the banks of the Mekong River, Phnom Penh has been the national capital since the French colonised Cambodia during the 19th century. The city has grown from a small fishing village to what is now the industrial, commercial, cultural and historical centre of Cambodia. We will visit to the Tuol Sleng Genocide Museum (a former torture centre) and the Choueng Ek Memorial at the site of the Killing Fields, to learn about one aspect of this country’s turbulent past. Phnom Penh has many other attractions including the Russian Market and National Museum. You could also take a stroll along the river’s famous Sisowath Quay and enjoy a coffee or cocktail at one of the many cafes while observing the bustling river traffic. You may wish to take a tuk-tuk ride around Phnom Penh (a tuk-tuk is a motorbike-taxi with an enclosed passenger cabin that can fit around 4 people). We cross the border from Cambodia to Vietnam by travelling by boat down the Mekong River from Phnom Penh to Chau Doc. Chau Doc is our base to explore the extraordinary Mekong Delta, a region in southwestern Vietnam where the Mekong River approaches and empties into the sea through a network of distributaries. Life in the Mekong Delta revolves much around the river, and many of the villages are often accessible by rivers and canals rather than by road. The region produces half of the country’s rice output which is more than Japan and Korea together. Enjoy a pleasant evening in a comfortable hotel in preparation for tomorrow’s bus journey. You will be travelling through the Delta where you can experience first hand the daily life in the region, before arriving in the bustling and vibrant Ho Chi Minh City. 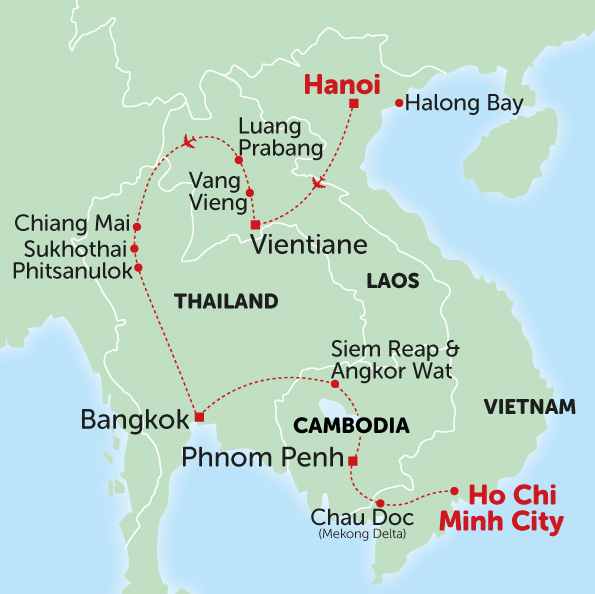 Ho Chi Minh City was known as Saigon until the end of the Vietnam War (around 1975). Originally a small fishing village, it is now the most important economic centre in Vietnam and is the largest city in the country. Traffic in the city is fairly hectic at the best of times but getting around is surprisingly easy by taxi or motorbike taxi, although drivers may not always speak English. Bus is the only form of public transport and motorbikes rule the road; there are around 3 million motorbikes cruising around the streets of Ho Chi Minh City. Your Tour Leader will take you on a walking tour where you will visit the War Remnants Museum and the Reunification Hall. 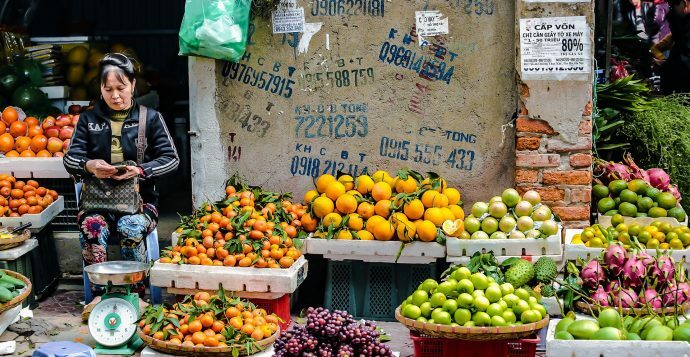 If you’re less of a history buff and more in the mood to haggle for a bargain, don’t worry, as we will also explore Ho Chi Minh’s largest market, the Ben Thanh Market. You can buy everything from cosmetics to live ducks here. There are also numerous food stalls at this market, and at the popular night market nearby. The food in Ho Chi Minh City is some of the best and most diverse in all of Vietnam so make sure you eat well during your stay. There are also many bars and clubs to spend your evening in. Diese Tour startet mehrmals im Monat und beinhaltet 13 Übernachtungen in Hotels , 1 Übernachtung in einem Hostel und 6 Übernachtungen im Gästehaus.